These are personal and historical notes about the tunes and songs that we have recorded on our Hog-eyed Man CDs. The vignettes include, and in some cases expand on, the words that we published in the printed liner notes for each CD. For some of the tunes we posted links or sound files for our original sources, as well as earlier or alternative versions, as we honed in on the particular recording we wanted to include on our albums. Here are two tunes learned from the playing of the venerable western North Carolina fiddler, Marcus Martin. Born in 1881, Martin was a master fiddler, banjoist, and dulcimer-builder from the Asheville area, who was recorded by UNC-Chapel Hill musicologist Dr. Jan Schinhan circa 1945- 1950. The first tune here is something of a mystery. True jigs (in 6/8 time) are extinct in southern oldtime music these days, but all the old-timers played a few. This one, which we got from an archive collection at Warren Wilson, seems like it might have originated as a song. We don’t know its true name, so we just call it Marcus Martin’s Jig. Snowbird resembles the Irish reel Paddy on the Turnpike and was once played by many fiddlers in the Blue Ridge Mountain region. Bill Hensley, a contemporary of Martin’s known for wild fiddling and tall tales, claimed it came from Cherokee leader and fiddler Junaluska (b. 1775). In Junaluska’s mountain community of Snowbird, NC, hundreds of Cherokee managed to avoid removal from the homeland of their ancestors during the Trail of Tears in 1838. (Incidentally, Snowbird (“Dudi”) was what the Cherokee called the Eagle, so as not to offend it by using its true name.) Marcus Martin’s ancestor, John Martin, was ethnically Cherokee, and some of the Martin family’s traditional music and crafts have roots in Cherokee traditions. However, Martin is thought to have gotten this particular setting of Snowbird from J.D. Harris (b. 1868), originally of Flag Pond, TN, whose impeccable style and even-then-archaic repertoire influenced a generation of area musicians in the early 1900s, particularly Manco Sneed, another of Martin’s mentors. Here you can listen to our arrangement of Marcus Martin’s Jig and Snowbird, along with our source recording for the unidentified slow jig (the quality of the source recording is poor, but the strength of Martin’s playing still shines through). Here’s a link to a live performance of this tune set. Everybody’s got a version of this classic. Ours comes from Allen Sisson (b. 1873) of Fannin County, GA, whose repertoire overlapped quite a bit with the western North Carolina and east Tennessee fiddlers of that era, including Marcus Martin, Osey Helton, and Manco Sneed. Our recording of this tune features the seldom-heard combination of fiddle, lap dulcimer, and banjo (Tom Baker). Legendary banjo-player, artist, and folk music preserver Art Rosenbaum stopped by the studio on his 79th birthday to hang out, and jumped in to sing some impromptu verses on this one. Thanks Art! This Durang’s Hornpipe is quite divergent from the tune of that name that is played by many fiddlers today, though certain melodic and structural similarities suggest a common root. The original tune was reportedly composed in 1785 by German immigrant W. Hoffmaster for “The First American Dancer,” John Durang (b. 1768). The folk process then took the tune all around the Appalachians, as well as over to Ireland (particularly the Sliabh Luachra region of Cork and Kerry, where a vibrant fiddle style shares many similarities with American oldtime music). Jason picked up this unique version from his Celo neighbor and fiddle mentor Bruce Greene, who heard it from W.L. Jake Phelps (b. 1882) of Todd Co., KY, who got it from Will Segal (b. 1860s). It’s one of those deep, emotive tunes that tells a musical story. Here’s a link to Jake Phelps playing the tune as recorded by Bruce. This is one of our stringband configurations, with Jason on fiddle, Rob on mando, Tom on banjo, Nancy on guitar, and Charlie on uke. Manco Sneed (1885-1974), a part-Cherokee fiddler living in western NC, got this distinctive tune from his mentor J.D. Harris (1868-193? ), originally of eastern TN, who in turn got it from Wiley Laws, a blind fiddler who immigrated from England in the 19th century and was the source of several regionally popular tunes. (The tune may be a derivative of the Irish reel Maude Miller.) We picked up the killer third part for the setting that we recorded on volume 3 from John Harrod’s field recording of Manco’s son-in-law, J. Laurel Johnson, himself a fine fiddler from Atlanta, GA. Manco once played that part too, and it bears the emotive syncopation and intricate phrasing characteristic of his music. To our knowledge, no other modern recording of Wiley Laws' Tune includes the third part. Manco and Laurel played the tune in the key of F. We like it in that key too, but for our recorded version we moved it up to the brighter and smoother key of G. Our pals Beverly Smith and John Grimm rounded out the sound on guitar and banjo. Below are our sources followed by our recorded version. Byard Ray (1910-1988) of Madison Co., NC, got the gist of this one from Manco Sneed; another that Manco had learned from J.D. Harris. Over the years, Byard’s version diverged into a few variants, which we arranged into a single setting for our recording on volume 3. Jason's mother took lessons with Byard Ray when Jason was young, and Byard even put a rattlesnake rattle in Jason' fiddle to give it more mojo. A tragic air believed by some to have been penned by a father condemned for the murder of his daughter’s suitor. Our version for volume 3 was based on both the playing of eastern KY’s finest oldtime fiddler, John Salyer (1882-1952), and the starkly beautiful, unaccompanied singing of Bruce Greene and Loy McWhirter. A wild piece with an enigmatic title from Alva Greene (1894 -1976), of Elliott County, KY. For volume 3 we recorded it as a duo with Rob on banjo-uke, and that's how we do it live, but Jason played this one solo in the 2016 fiddle contest at Clifftop, WV. It was his first time at the festival. Here's a link to a video of the contest finals, in which Jason first plays Johnny Court the Widow (see below, volume 1) and then Buck Hoard. (The video link features all five finalists -- each one an outstanding fiddler who could've won the contest. Jason's two tunes start around 23:30). Our interest in Bile Them Cabbage Down was inspired by Byard Ray’s rejuvenating take on an otherwise tired chestnut. This was the first tune that Byard taught Jason’s mom in the early 1980s! We actually recorded two very different versions of Bile Them Cabbage Down for Hog-Eyed Man 3 and had a tough time choosing which to use. One--the one we went with in the end--was a quartet singing version, with Jason on fiddle and lead vocals, Beverly Smith on guitar and harmony vocals, Rob on mandolin and harmony vocals, and John Grimm on clawhammer banjo. We pulled the lyrics from all over the place, including a new verse spontaneously composed by Jason during bedtime song hour with his boys. The other version that we recorded was a stripped-down instrumental take, with Jason's fiddle and Rob's mando tuned down several steps in pitch, and John soulfully plunking on fretless banjo. We loved that sound and it was hard to let it go, but ultimately we felt the album would benefit more from the oldtime party version. Here's our source--Byard Ray's cut from the 1960s with Peter Hoover--along with the quartet version we used on vol. 3, and then the unmixed trio cut that got away. And here's a live duo version. More recently, we have continued our journey with this tune with the unearthing of a western NC version played by Osey Helton circa 1939. See Jason's blog post about the discovery here. 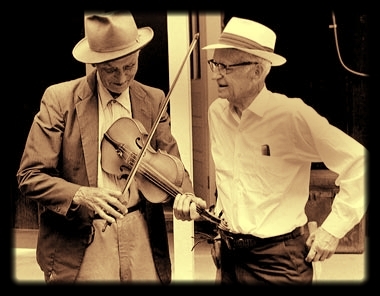 John Cowan Powers (1877-1953), of Russell Co., VA, was a brilliant fiddler who in 1924 beat out J.D. Harris, Charlie Bowman, and Uncle Am Stuart in a celebrated fiddle contest in Johnson City, TN. Later that year his family band recorded this unique version of what’s more commonly called “Wagoner” for Victor Records in New York City. So here is that original source recording, followed by our version for volume 3, with Jason on fiddle, Rob on mando, and Beverly Smith sitting in on guitar. On the web you can also find our live duo version. Master oldtime fiddler John Salyer, of Magoffin County, Kentucky, was never commercially recorded. Fortunately, in 1940 and 1941 Salyer and his family made many home recordings of his unusual repertoire, which Bruce Greene brought into the light many decades later. This is our interpretation of Salyer's instrumental version of the Scottish ballad William Reilly, with Rob's dulcimer accompaniment drawing shades of inspiration from John Coltrane (1926-1967) of High Point, NC. (fiddle - AEAE; dulcimer - DAD, capo 4). From Isham Monday (1879-1964) of Monroe Co., KY, via Bruce Greene, who long ago taught this tune to a young Jason in Celo (see Jason's blog entry here for more about playing Apple Blossom with Bruce over the years). This was the first tune we recorded for vol. 1. Isham (pronounced ICE-um) is one of the old masters. He had an enduring, dignified power in his playing that comes through on every recording we've had the pleasure to hear. Though we'd truly rather listen to Isham than ourselves on any given day, our recording of Apple Blossom aimed to bolster and fortify the ancient, celebratory melody with some low-register dulcimer and harmonic variety on fiddle, while hopefully staying true to the dignity and essence of the source. Like Isham, we tuned our instruments low, playing in the key of B (fiddle - F#BF#C#; dulcimer - BF#B). Listen all the way to the end of Isham's version to hear him chastised (or protected?) by Elizabeth Monday: "that's enough of that one ... you'll give out!" For seven long years, and then he didn't get her." From Bruce Greene's 1976 field recording of Roy Bennett of Battletown (Meade County), KY, along the Ohio River. Bruce told us that Bennett was likely born in the 1890s. Like many fiddlers from communities along that waterway of commerce, Bennett played a number of tunes with a northern, Scots-Irish flavor. We love his tunes and have recorded one on each album (check out Stuart's Longbow, on vol. 2; and Kiss Me Sweetly, on vol. 3). Other musicians, including Bruce Greene, have interpreted the melodic and harmonic structure of Bennett's Johnny Court the Widow differently. We love those other versions. Travis and Trevor Stuart's is particularly great. We did our best to be faithful to Bennett's rendering of the tune, though personalized with our own harmonic and rhythmic building blocks. Like Bennett, we recorded the tune in the key of F, but played out of standard tuning (fiddle - GDAE). But note that Bennett may have tuned GDAD. More recently, we started playing the tune in the friendlier key of G as well. Jason played that version in the finals of the 2016 Clifftop fiddle contest, as mentioned above. (Jason played it with all strings tuned down in pitch about one whole step.) Our buddy Tom Baker has worked out a nice version of this on three-finger banjo, so maybe we'll revisit it one day. Incidentally, it was during our exploration of this tune in late 2013 and early 2014 that we first hoped our collaboration could potentially turn into something interesting for people beyond the two of us in Jason's basement. Hiram Stamper as a young man. Doris Ulmann Collection, Berea College.